There’s so much demand for the new Honda NSX that the car firm has had to open a pre-order bank for the hotly anticipated supercar. For a deposit of £5,000 potential owners can be among the first in the country to get behind the wheel of the brand new Honda NSX when it hits showrooms in 2015. Already 20 eager punters in the UK have stumped up their cash and are now waiting for delivery. 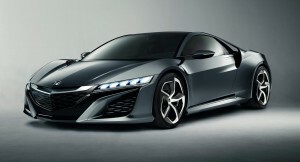 The dynamically-styled NSX Concept was first unveiled at the Detroit Motor Show last year giving an indication of the design of the next great performance vehicle from Honda. That vehicle featured a low and wide stance with dynamic proportions highlighted by edgy details that give it a supercar look. The interior package for the 2015 Honda NSX boasts outstanding visibility, a strong driving position, and an intuitive ‘Simple Sports Interface’ that minimises interior clutter, allowing the driver to focus on the driving experience. Consistent with the spirit of the original Honda NSX, Honda’s designers have had a lot to live up to but they appear to have done it. The Honda NSX will aim to deliver a new sports car experience that combines supercar dynamic capabilities with advanced environmental performance. It will be powered by a mid-mounted, direct-injected V6 engine mated to Honda’s Sport Hybrid SH-AWD (Super Handling All-Wheel Drive) system. It will also utilise a unique 2 Electric Motor Drive Unit with a bilateral torque adjustable control system so the new hybrid all-wheel-drive system can instantly generate negative or positive torque to the front wheels during cornering, which Honda anticipates will deliver handling performance unmatched by previous AWD systems. The Honda NSX is being developed by a global team led by designers and engineers at Honda in the US and will be made over there too. News of a pre-order bank follows in the footsteps of the previous NSX which saw 25 pre-orders being taken a year ahead of its UK launch. The first generation NSX was launched in 1990 and spent 15 years in production selling 18,000 units globally with 290 being sold to customers in the UK. Though you don’t see many of them around, the NSX was a seriously impressive car and should have done better for Honda. This entry was posted in Car Updates & Releases, Cars, Manufacturer News, Performance Car, Sports Car and tagged 2nd Generation Honda NSX, Detroit Motor Show, Honda NSX, Honda NSX 2015, Honda NSX Price, Honda NSX Release Date, Honda NSX Spec, Honda NSX UK, lease the honda nsx, New Honda NSX, NSX, Performance Car, Simple Sports Interface, sports car, Super Car, UK by Steve Lumley. Bookmark the permalink.